This study aimed to compare the extent of lateral thermal spread of surrounding tissues after the use of advanced bipolar and ultrasonic coagulation and shearing devices. 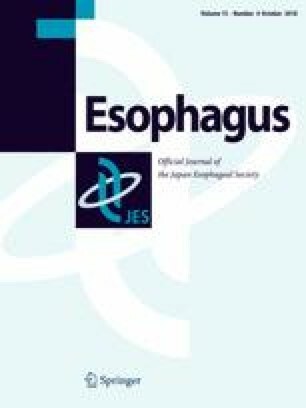 Association between recurrent laryngeal nerve paralysis (RLNP) and such devices was assessed in patients who underwent minimally invasive esophagectomy (MIE). LigaSure™ (LS) and Sonicision™ (SONIC) were used. In ex vivo experiments using the porcine muscle, blade temperature and tissue temperature were measured using a thermometer after the activation of both devices. For the clinical assessment, 46 consecutive patients who received MIE were retrospectively assessed. The temperature generated at the blade of both devices increased with the activation time. The blade temperature of LS was significantly lower than that of SONIC (P < 0.001). The blade temperature of SONIC exceeded 100 °C after 3-s activation. The temperature of surrounding tissues after a single activation of the devices decreased with the tissue distance from activation blade. The temperatures of tissues at 1 and 2 mm away from the blade side of LS were significantly lower than those of SONIC (P = 0.001 and P < 0.001, respectively). The temperature of tissue 2 mm away from the blade side of LS increased 6.4 °C from the baseline temperature. Furthermore, the incidence of RLNP in the LS group was lower than that in the SONIC group (P = 0.044). This study highlights the necessity of spatial and temporal recognition of the thermal spread of coagulation and shearing devices to reduce the thermal injuries following MIE. This work followed the guidelines set forth in the Helsinki Declaration of 1975, as revised in 2000, concerning Human and Animal Rights. This article does not contain human or animal subjects performed by any authors. This was a retrospective study approved by the institutional review board of the National Cancer Center Hospital.